Spinels and pyrochlores are two of the most important crystal structures that are known to exhibit geometric magnetic frustration. In these materials there are three-dimensional networks of corner-sharing tetrahedra, a structural arrangement that leads to a high degree of magnetic frustration if the dominant nearest-neighbor interactions are antiferromagnetic. One interesting question that has not, to our knowledge, been addressed experimentally concerns whether half-integral spins exhibit fundamentally different behavior than integral spins in frustrated lattices. In order to address this issue we have been systematically investigating the magnetic and structural properties of spinels in which integer or halfinteger- spin transition metal ions are located on the Bsublattice. In this report we describe the results [ 1 ] for an integer-spin ( S = 1 ) frustrated magnet GeNi2O4. 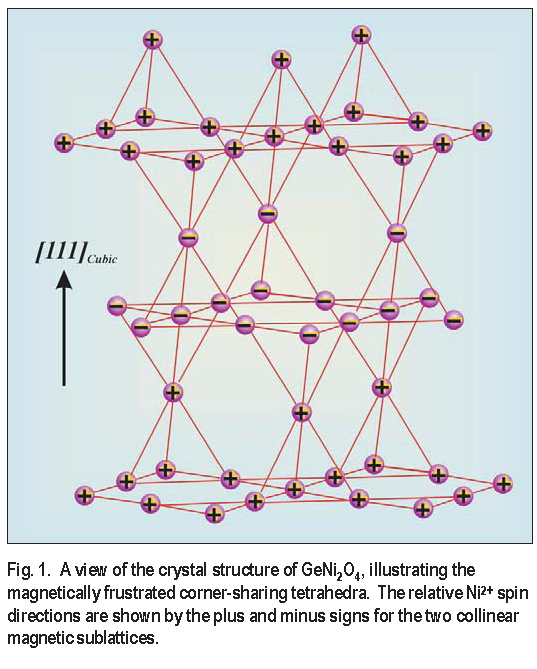 GeNi2O4 is a normal spinel with the Ni2 + ions on the magnetically frustrated B-sites and the non-magnetic Ge4 + ions on the A-sites. GeNi2O4 becomes antiferromagnetic below a Néel temperature of TN 12 K. The crystal structure of GeNi2O4 has been refined, based upon neutron powder diffraction data from BT-1, in the cubic space group Fd3m at all temperatures. The structural refinements clearly demonstrate that there is no more than 1 % cation inversion ( interchange of Ge4 + and Ni2 + ions between A and B sites ), since Ge and Ni have very different neutron scattering lengths. This information cannot be obtained from x-ray diffraction due to the similar x-ray scattering strengths ( atomic numbers ) of Ge and Ni. In addition, we have verified that GeNi2O4 remains cubic below TN using very high-resolution synchrotron x-ray powder diffraction at the Advanced Photon Source [ 1 ]. In Figure 1 we show the crystal structure of GeNi2O4, with the relative spin orientations of the Ni2 + ions illustrated by plus and minus signs. The low temperature magnetic structure is a simple two-sublattice collinear structure in which the Ni2 + spins are aligned in ferromagnetic ( 111 ) planes, and the spin direction of the ( 111 ) planes alternates along the [ 111 ] direction [ 2 ]. Assuming this magnetic structure, we obtain a good fit to the magnetic peak intensities in our low temperature ( T = 1.4 K ) neutron diffraction pattern. 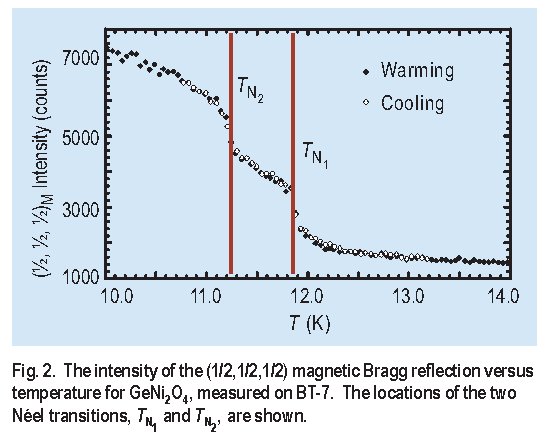 GeNi2O4 exhibits a surprising property, illustrated in Figure 2 where we plot the intensity of the magnetic ( �, �, � ) Bragg reflection as a function of temperature. The Néel transition in GeNi2O4 clearly consists of two distinct transitions, the first located at 12.13 K and the second at 11.46 K. Such double Néel transitions have been observed in one-dimensional frustrated antiferromagnets [ 3 ], such as the chain Haldane magnet CsNiCl3, but this is the first observation, to our knowledge, of such a transition in a three-dimensional frustrated magnet. The small splitting of the N�el transition shows that the Ni2 + ions in GeNi2O4 have very little magnetic anisotropy, and should thus be in the Heisenberg universality class. The observation that GeNi2O4 remains cubic below TN is in marked contrast with results for the transition metal oxide spinel ZnCr2O4 [ 4 ]. ZnCr2O4 undergoes a cubic-tetragonal structural phase transition at TN. Such structural transitions have been described [ 5, 6 ] as threedimensional analogs of the spin-Peierls transitions that occur in S = 1/2 one-dimensional antiferromagnets. Furthermore, we have observed [ 1 ] the appearance of tetragonal distortions in two other spinels, GeCo2O4 ( S = 3/2, effective spin 1/2 at low temperature ) and ZnFe2O4 ( S = 5/2 ), each of which has half-integer-spin transition metal ions. In both of these cases, the structural transitions are also closely associated with TN, which suggests that distortions from cubic lattice symmetry generally occur at the Néel transitions in half-integer-spin magnetically frustrated spinels. In light of these observations for half-integer-spin systems, it is interesting to speculate that the absence of a structural transition in GeNi2O4 may be a consequence of the integer-spin of the Ni2 + ion. In one-dimensional antiferromagnets, spin-Peierls transitions for spin-1 magnetic ions are prevented by the appearance of Haldane gaps, which render the chains rigid against dimerization [ 7 ]. This raises the question of whether a related phenomenon can also exist in a three-dimensional integer-spin frustrated lattice, which naturally leads us to measurements of the spin excitations in the Néel state of GeNi2O4. In Figure 3 we show the low temperature heat capacity of GeNi2O4. The data are superimposed with a fit including a contribution from gapless isotropic spin-waves and a gapped excitation located approximately = 11 K above the ground state. The gapped excitation in GeNi2O4 is a property of the Néel state in the cubic structure, and thus clearly requires a different explanation from the much higher energy excitation reported in tetragonal ZnCr2O4 [ 4, 6 ]. The absence of a structural phase transition in GeNi2O4 combined with the gapped magnetic excitation spectrum strongly suggests a direct connection between these phenomena and the integer spin of the Ni2 + ion. M. K. Crawford et al., Phys. Rev. Lett., submitted; M. K. Crawford et al., unpublished results. E. F. Bertaut et al., J. Phys. 25, 516 (1964). M. F. Collins and O. A. Petrenko, Can. J. Phys. 75, 605 (1997). S.-H. Lee, C. Broholm, T. H. Kim, W. Ratcliff, and S.-W. Cheong, Phys. Rev. Lett. 84, 3718 (2000). Y. Yamashita and K. Ueda, Phys. Rev. Lett. 85, 4960 (2000). O. Tchernyshyov, R. Moessner, and S. L. Sondhi, Phys. Rev. Lett. 88, 067203 (2002). F. D. M. Haldane, J. Appl. Phys. 57, 3359 (1985).